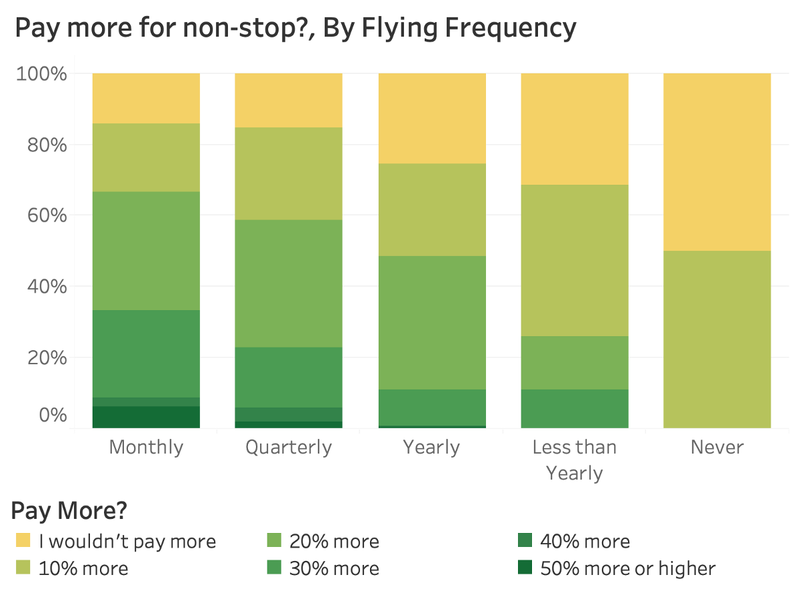 From what our respondents told us, it looks like the more often you fly, the more willing you are to pay more for the convenience of a non-stop flight. 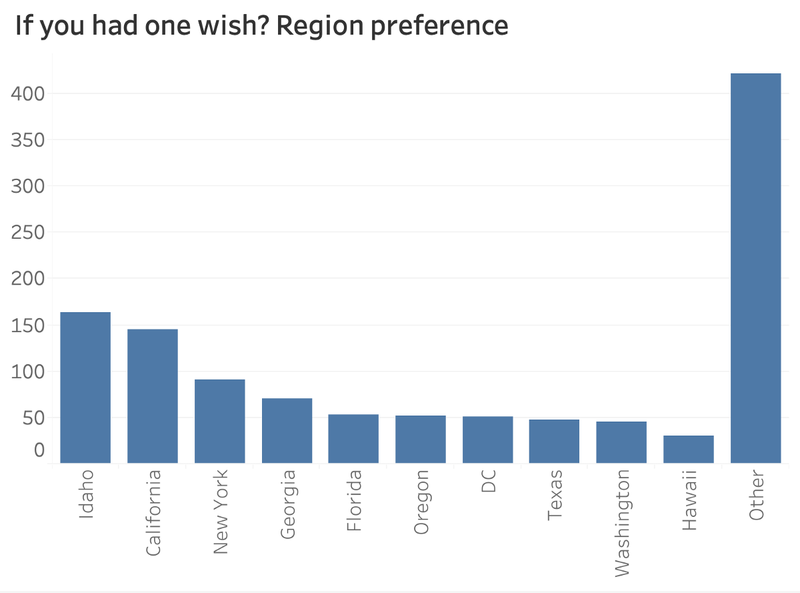 More people wish they had a direct flight to New York City than any other city, but when it came to states, more people wished for more flight options within Idaho than elsewhere. If you fly from Boise, you’re the least likely to need to drive somewhere because a flight option is unavailable. If a genie gave you 1 wish? Most of us are coming and going periodically, and we sometimes rely on airports to get us where we’re headed. Since our airports aren’t huge, we often need to use connecting flights to get to our final destination. The Boise Metro Chamber and other Idaho leaders are trying to make air travel more convenient, and they want to know which non-stop flights would help you most. We set a Make Idaho Better record with this survey! 1,171 responses at analysis time. That blew our previous record of 822 away. Very exciting. 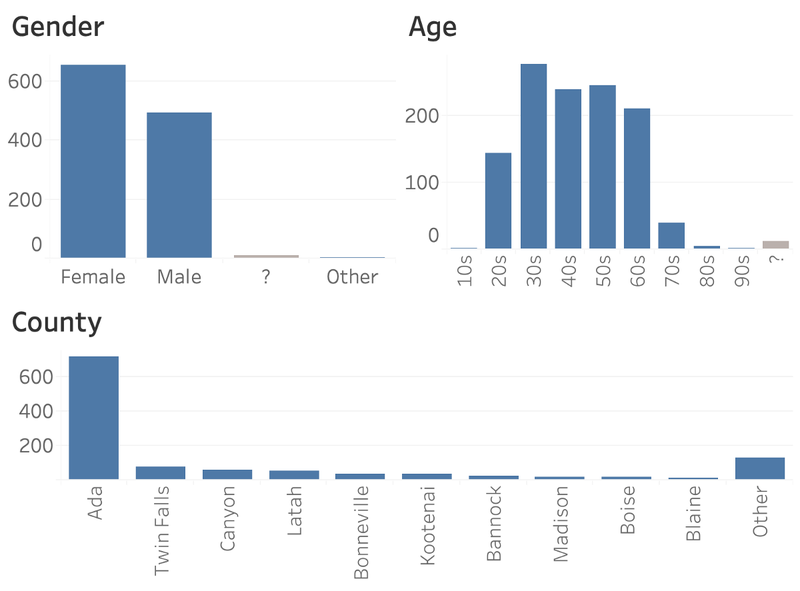 Our sample had more women than men, a pretty even age distribution (and first respondent over 90! ), and had the most participation from Ada County. The high participation from Ada County isn’t very surprising since we were working with the Boise Metro Chamber and they helped promote the survey. Alright, to kick things off, we always start with some context questions. For the topic of Idaho Air Travel, I wanted to know the airport each responded uses most often. This helps us check whether there are any interesting similarities or differences across people that fly from different places. 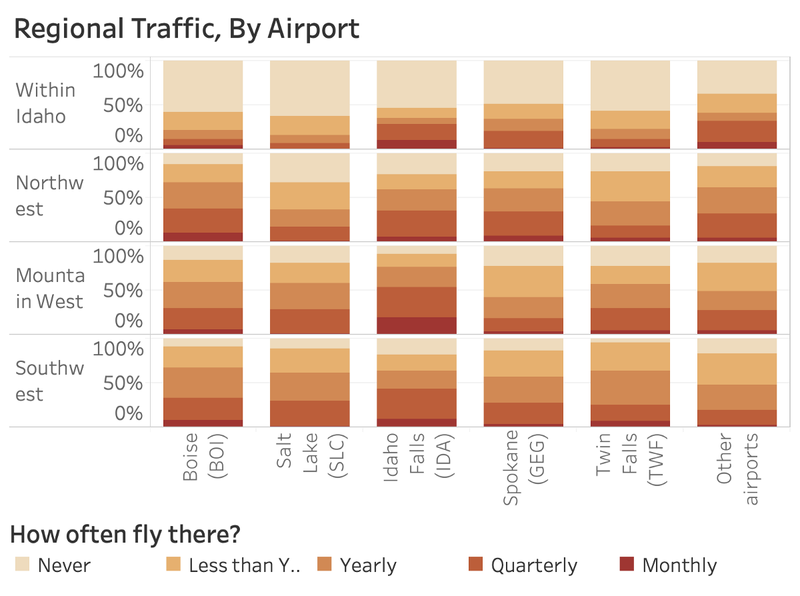 Overall, about 70% of the respondents said they fly from the Boise airport most often, though we had respondents that use all of the main Idaho airports (I used this page as a guide). Since Idaho’s a big state and airports are pretty spread out, flying out of airports in neighboring states seems like the best option for many. For instance, Salt Lake City and Spokane airports were both in the top 4. Next, I wanted to get a sense of how often people drive when they wish they could fly. For context, I live in Boise, and I always drive to visit McCall and Sun Valley, but I wouldn’t necessarily fly there if I could either. I would rather fly to Coeur D’Alene though. I wondered how other folks think about this sort of thing. 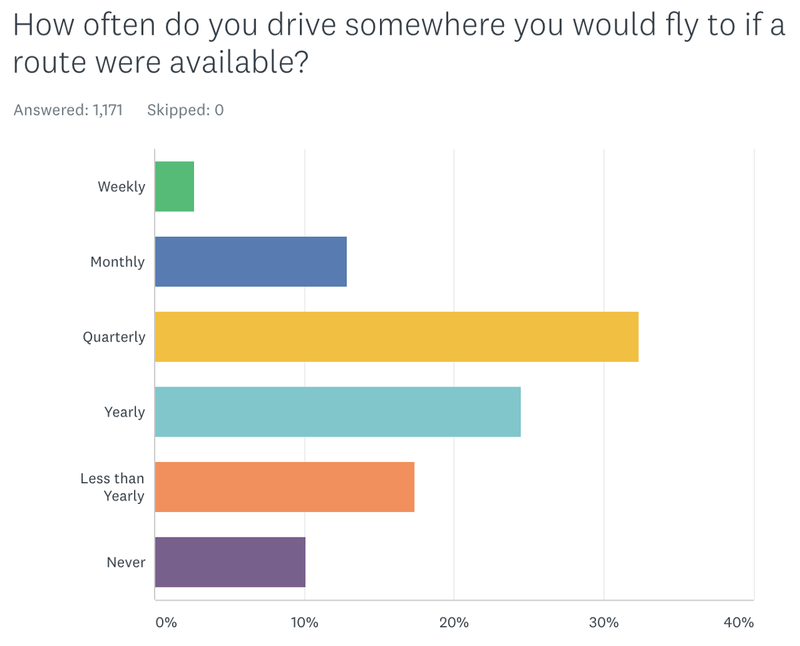 The survey question didn’t specify locations, but rather asked how often people drive when they wish they could fly. 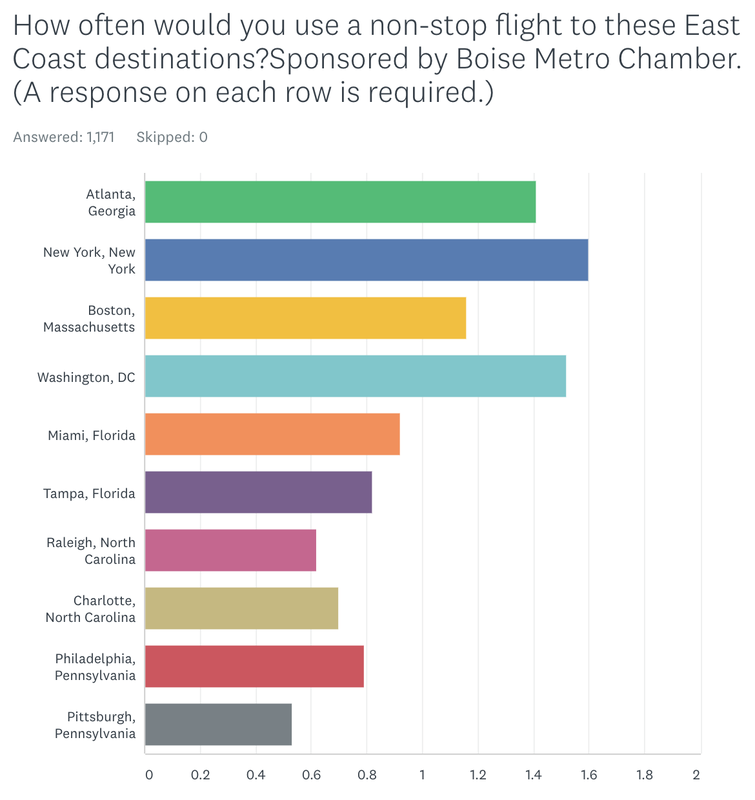 But let’s apply some segmentation to this question and see if we get different answers from respondents based on the airport they use most often. This chart shows us the proportion of people that said they drive instead of fly, by their primary airport. Of the top airports, it looks like Boise has the least amount of people driving regularly instead of flying (on a yearly basis or more often) at 65%, though that’s still a pretty big number. 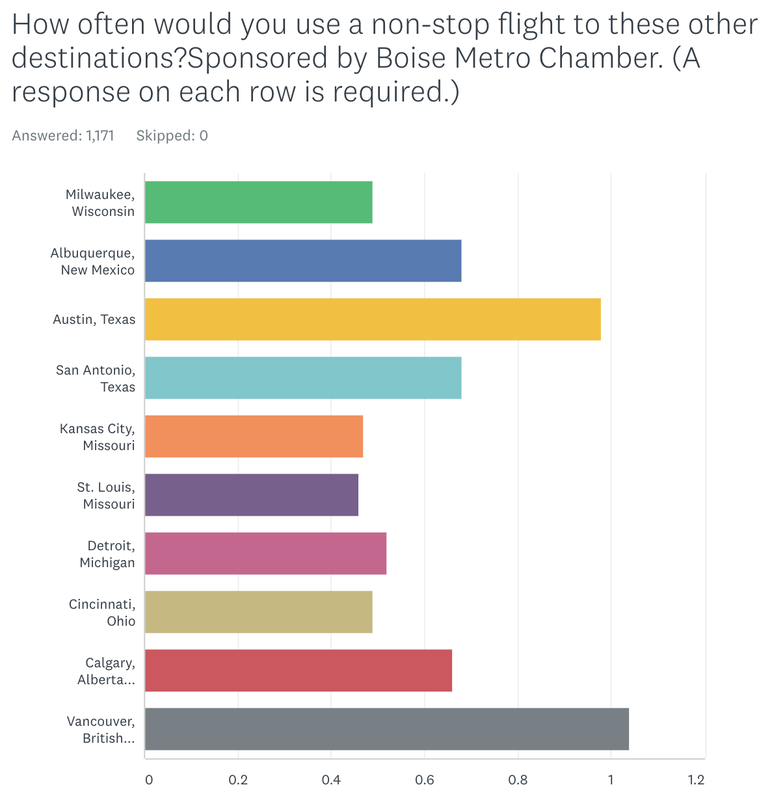 Compare that to Salt Lake’s airport, where over 90% of our respondents said they’re driving instead of flying regularly. Let’s talk some more context. 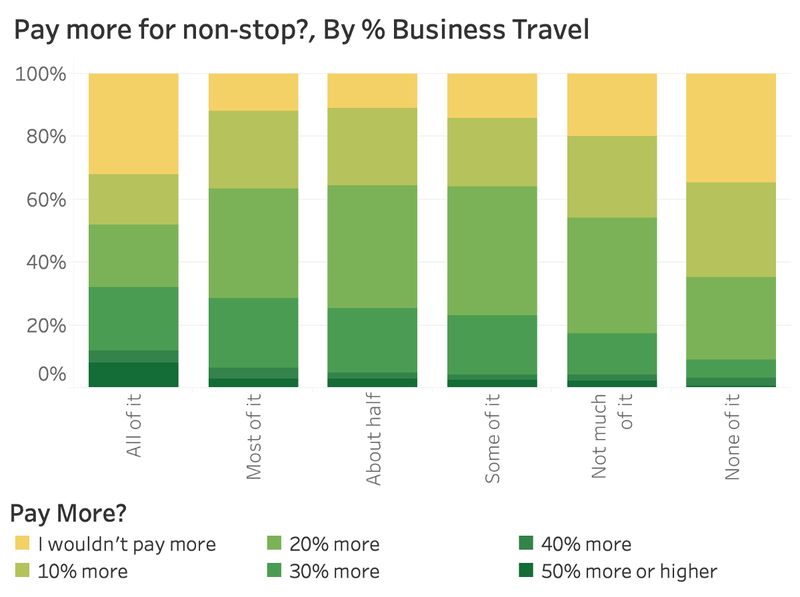 People can travel for all sorts of reasons, whether business or pleasure, and I was curious to know how often it’s business-related. Maybe this could be a helpful demographic for segmentation. Overall, the biggest group was “Most of it” (26%) and the second most common answer was “None of it” (22%). Most everybody else was in between. This seems like a pretty business travel -heavy group. But, that’s not very surprising given that the Boise Metro Chamber helped promote the survey and sent it to other Chambers across the state. I’m guessing if we had responses from every Idahoan, we’d see far less people answering with frequent business travel. Let’s check what proportions look like for different Idaho airports and see if anything interesting jumps out. The first thing I noticed here is most of the airport proportions look similar except for two — Idaho Falls and Spokane. 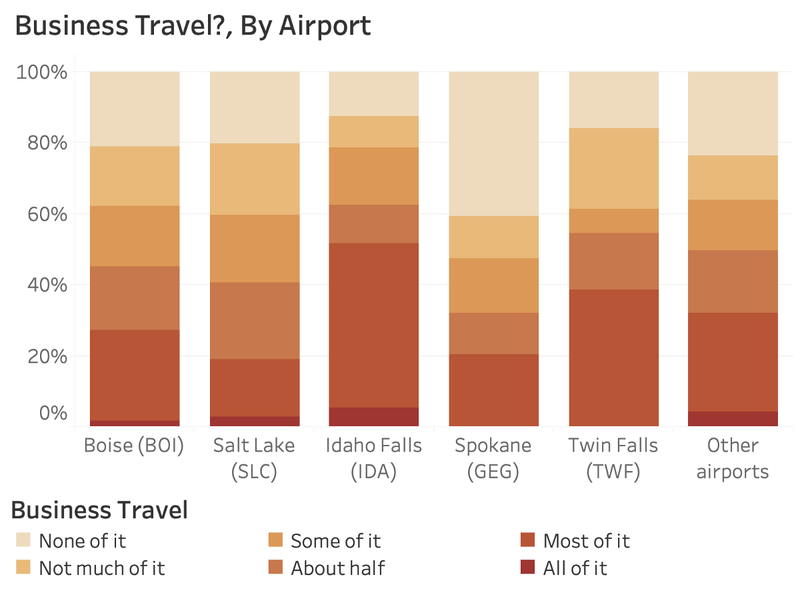 For Idaho Falls, there’s a much higher proportion of people that do a lot of business travel. And for Spokane, there’s much less. 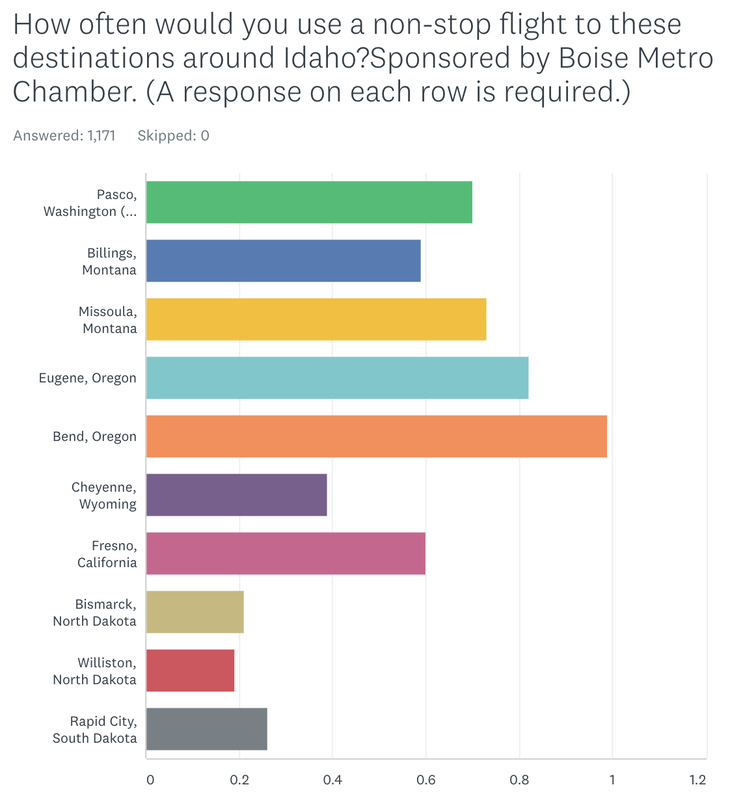 I don’t have an explanation for Spokane, but I do know that the Boise Metro Chamber shared the survey with the Idaho Falls Chamber, so it looks like it might have been circulated more around business types there than elsewhere. Let’s also look at this by Age. I’m betting there’s some interesting differences here — people are at different spots in their careers at different ages, after all. Bingo. 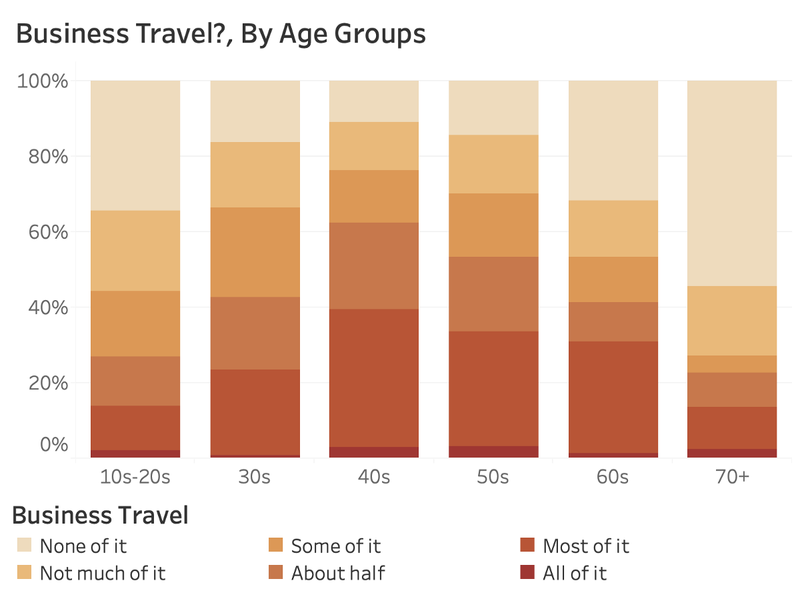 People over 70 are doing the least business travel since many of them are probably retired, and people in their teens and 20s are the second-least. And the age group that’s doing the most business travel is in their 40s, with a slight edge over people in their 50s and 30s. This makes sense to me since people are usually approaching the peaks of their careers at this stage. Guessing we have more senior managers or executives in this group, and they may need to go close deals and supervise branches or projects. Now let’s look at how often people fly to different regions. Options were Monthly, Quarterly, Yearly, Less than Yearly, or Never. 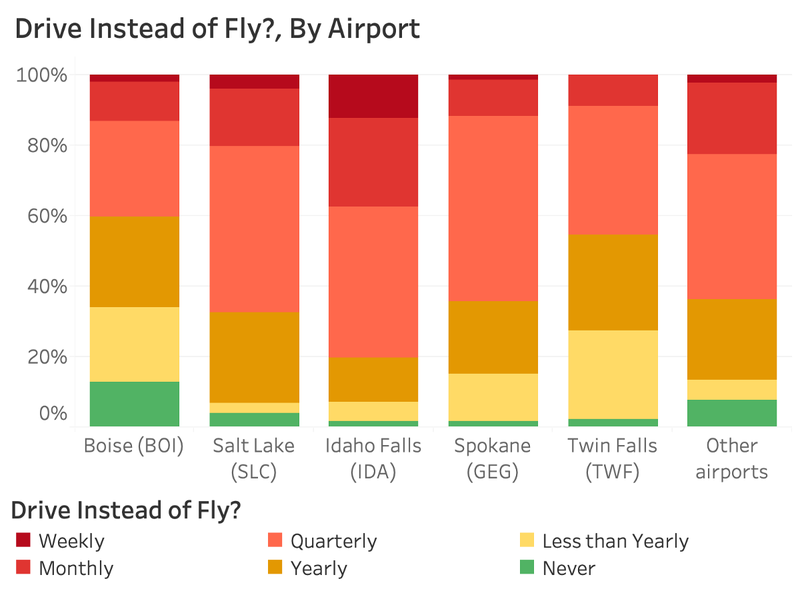 Overall, the weighted average chart shows us that the Northwest and Southwest are the most flown to regions from Idaho airports, with the Mountain West being close behind. Nothing surprising with that. And then, about half as frequent are flights in Idaho and the other options. I kind of expected flights within Idaho to be more common, but from what we gathered with the driving question, I’m guessing a lot of the flights people want are currently unavailable. We can also look at this by airport. This chart is pretty overwhelming, but it shows frequency of flight patterns to the first 4 region options. A standout to me here is that people flying from Boise seem to be going to Idaho destinations less than the other airports, despite my guess that there are more Idaho routes offered there. Another standout seems to be how often the Idaho Falls folks are flying to the Mountain West (highest by a long shot). But this question can serve another purpose too. 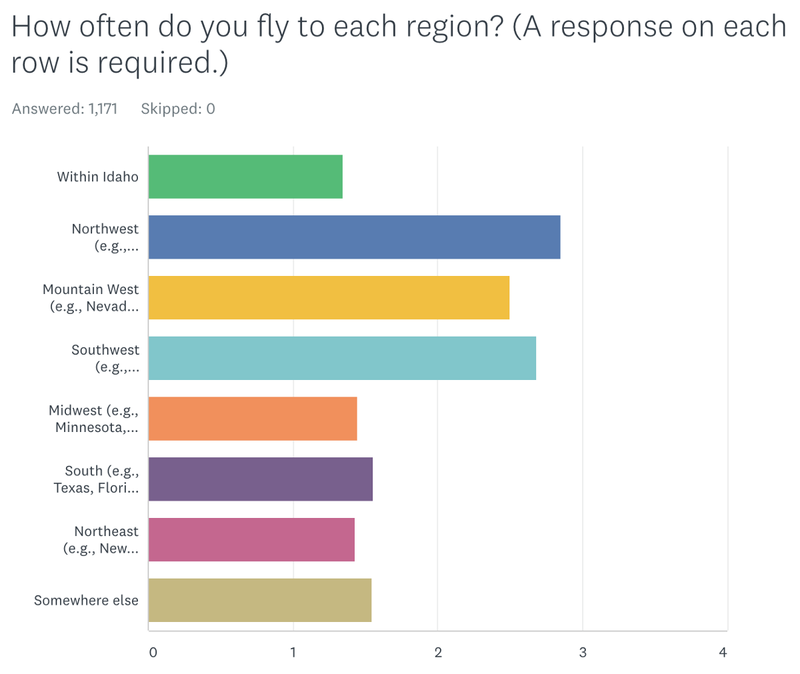 Since the region options are exhaustive, and cover every possibility with the “Somewhere else” answer, we can extrapolate how often each respondent typically flies in general. 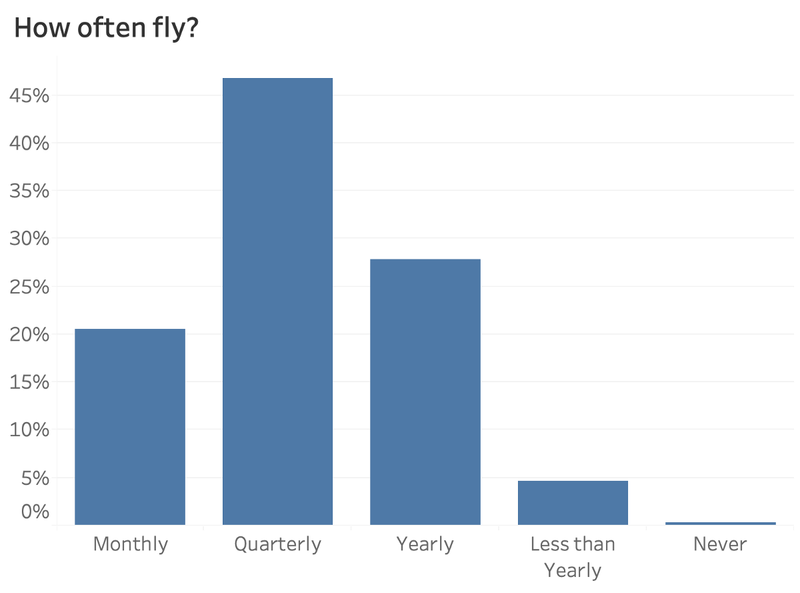 This view shows us that about two thirds of our respondents are flying on a quarterly basis or more often (about 67%). This could come in handy for segmenting the next question! Now, let’s talk dollars. It seems to me like everyone would rather fly non-stop than have a layover (unless you really love airport smoothies), but I’m curious whether people would be willing to pay more for the convenience. And if yes, how much more? Overall, the most popular response was “20% more.” So, let’s see — if you’re flying to the East Coast for $400, then we’re talking an extra $80 ($480 total). Yeah, that seems reasonable to me. 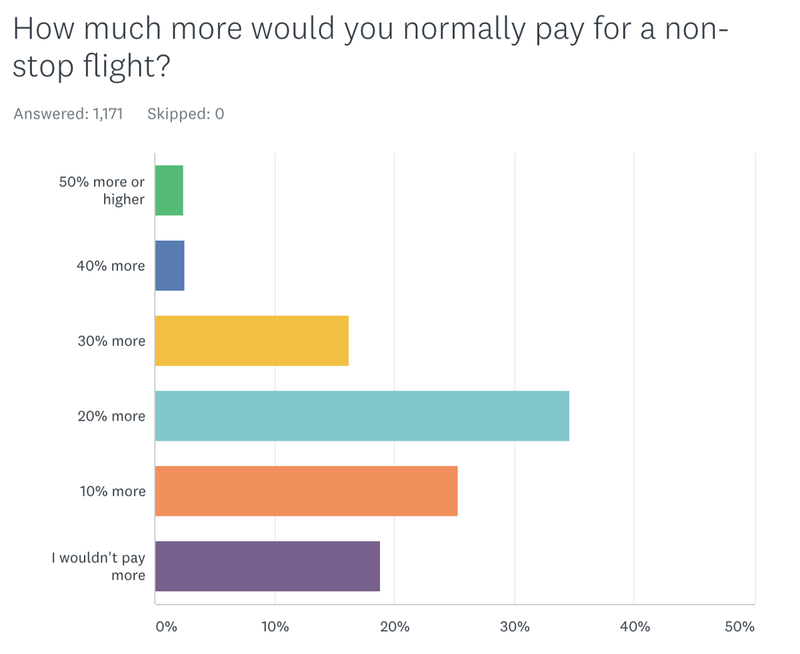 And, based on the proportions of the other answers, we can definitely tell that our group is mostly willing to pay more for the convenience — only 18% said they wouldn’t pay more. Some people would even pay 50% or more, but those are probably the types that fly business class and first class. I’m wondering if this changes much based on people’s airport. Nope. Doesn’t look like it. Everything’s pretty even. 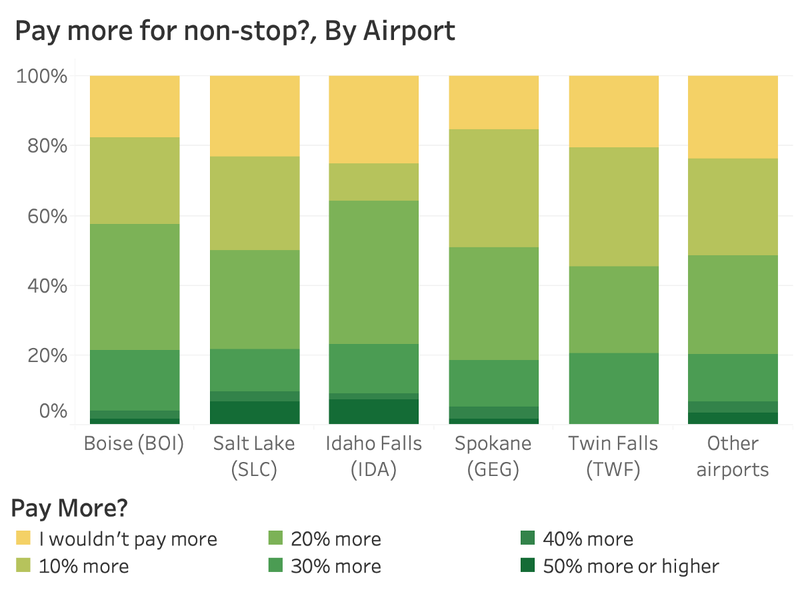 If there’s a standout, I’d say it’s that the Idaho Falls travelers we heard from are willing to pay 20% more at higher rates than the other airports. But… we already know these are people that are doing more business travel. When shorter travel times means you can get more done and maybe close more deals, it probably feels like a good investment to save some time. Let’s check this directly, though. Since we have that question about the frequency of business travel, we can see if there appear to be meaningful differences. Sort of. Though, it’s not necessarily what I expected. 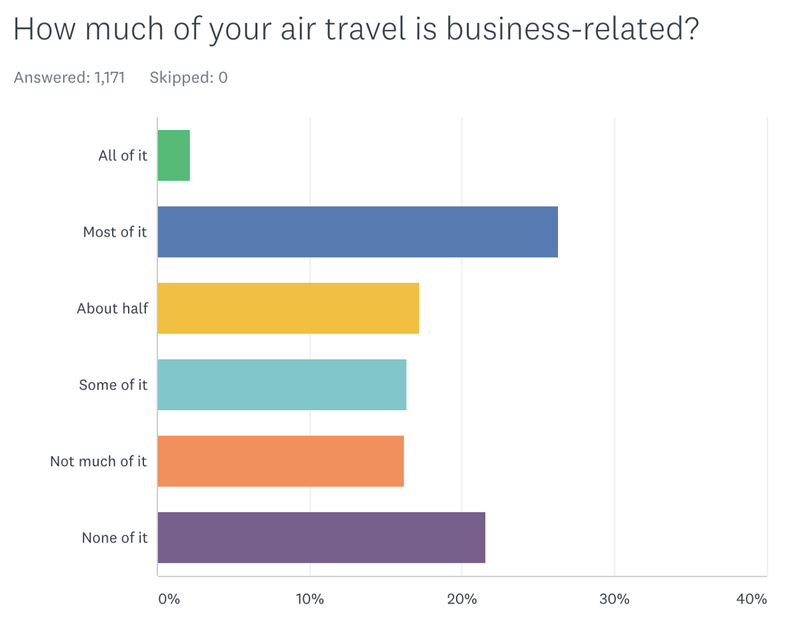 I would have guessed that the people that fly for business the most would be the least price sensitive, and those that travel for business the least would be the most sensitive to price. Not the case — respondents in the “Most of it” to “Some of it” range were generally the most willing to pay more. I think a better way to look at this might be frequency of travel, because you might say that business travel is “All of it,” but you only travel every other year. Nailed it. Looks like my guess was spot on — the more often you fly, the more you’re willing to pay for the convenience of a nonstop flight. Case closed, my dear Watson. This question is arguably the most valuable one. Of all the places you could have a non-stop flight, what would you want most? This is better than ranking or evaluating set options, because people can choose their ideal situation. Overall, our word cloud chart shows a few standouts — Boise, New York, Atlanta, and Idaho Falls. But, we shouldn’t take these at face value because people always type things in differently and word clouds can’t account for that. So, I rolled up my sleeves and did some semi-manual categorization work to standardize the answers and make them more useful. 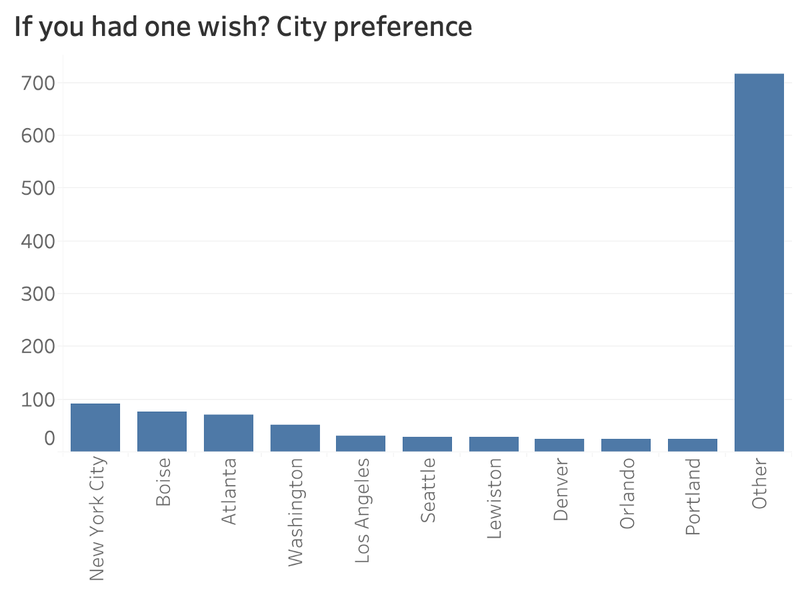 Here’s the city view — the most popular request was a direct flight to New York City, with about 100 votes. Though that’s less than 10% of all the responses, it’s pretty impressive that so many people chose that flight out of thin air, unprompted by choices or anything. Boise was the second most-requested non-stop route. But city isn’t the whole picture. State can be really helpful because perhaps there are a lot of requests for Idaho flights but they’re spread out between different cities. This could go unnoticed unless we tally up all the requests in Idaho. And that’s exactly what we see here. Idaho routes were the most requested, at around 160. California was next, and then New York. There were also lots of requests for a generic “East Coast” connection, but that didn’t make the top 10. That’s all for the general questions I included in the survey. The below questions were sponsored by the Boise Metro Chamber and were oriented mainly towards their local goals. That’s how Make Idaho Better’s business model works — we send out surveys that apply to the whole state, but clients can pay to add their specific questions. They asked how often you would use certain non-stop flights if they were offered. First up, Idaho and regional routes. 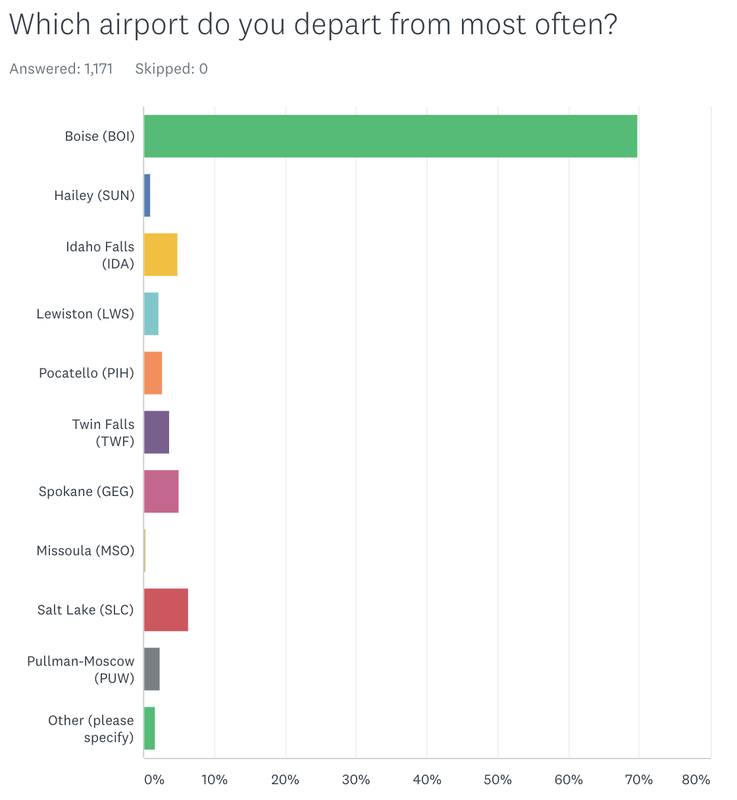 For the Idaho options, Coeur D’Alene was the most popular choice and Idaho Falls edged out Lewiston for second place. For regional options, Bend, Oregon emerged as the top route in the weighted average. Second place was a near toss-up between Eugene and Missoula. Next, the East Coast and other national/international options. For the East Coast, New York City got the gold, DC got the silver, and Atlanta got the bronze. Not too surprising since we saw these cities in our top 10 dream routes chart above. For other national/international routes, Vancouver, BC got the edge over Austin, and those two were head and shoulders above the rest. 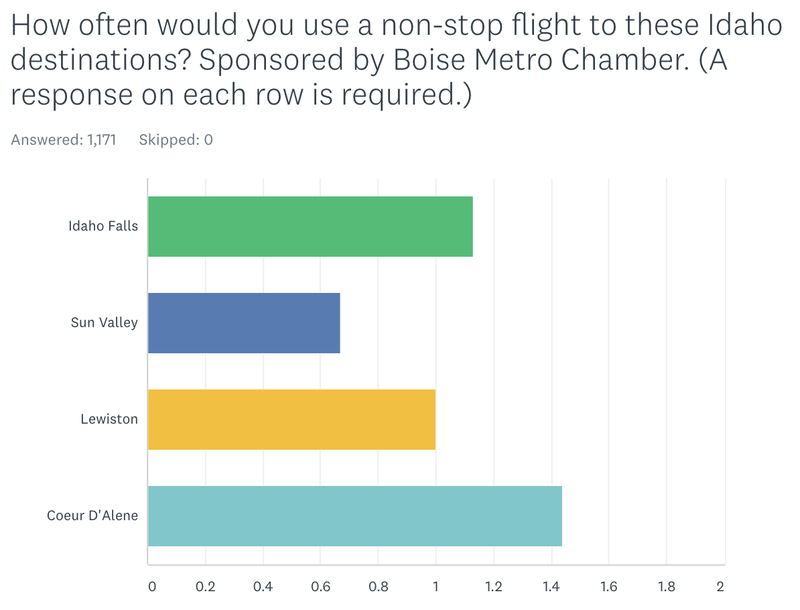 The Boise Metro Chamber wanted to know where respondents work so that they can follow-up and advocate for these organizations with airlines.